There are two more days left of Summerlicious! This year, the citywide restaurant event began on July 8th and will end on July 24th, so you still have this weekend to check it out. With over 220 restaurants participating, including 24 new participants, I'm confident that you'll find a 3-course menu to whet your appetite. Summerlicious (Twitter: @LiciousTO, Facebook: LiciousTO) prices range from $18 to $28 for lunch, and $28 to $48 for dinner. 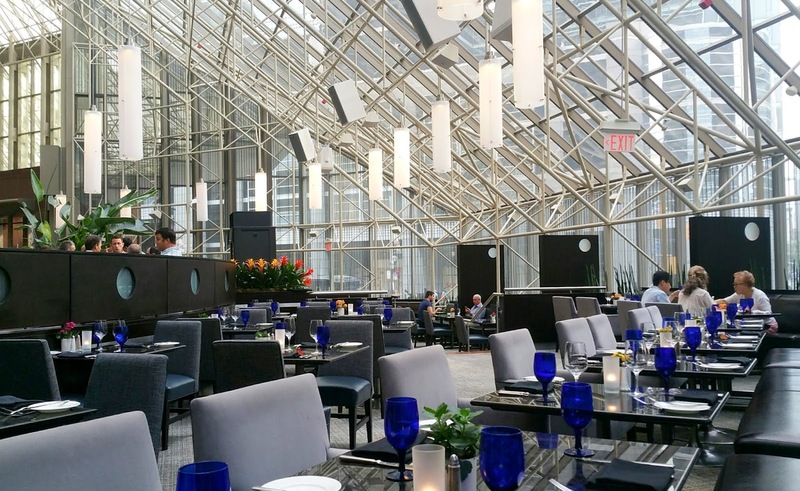 Thanks to Azure Restaurant & Bar, I was invited back to the restaurant once again to try their Summerlicious menu (this visit marks my fourth time at the restaurant!). Located in the open lobby of the InterContinental Toronto Centre (Twitter: @ICTorontoCentre, Facebook: InterContinental Toronto Centre). Azure's floor-to-ceiling windows never fail to 'wow' me. I love how their open space and glass canopy can give the ambiance of outdoor dining all year long. Drinks are not included in Summerlicious but they are a requirement for me :) Azure serves VERY boozy drinks (note the bold, italics and caps for "very")! Azure substituted figs with blackberries because they ran out of figs. Boo. I was disappointed because I love figs, and the entire time I couldn't stop thinking about how perfect truffle honey figs would go with the savoury prosciutto and the sweet-tartness of the balsamic. Thankfully, the blackberries worked well too. The baby watercress added a very welcoming "lightness" to the appetizer. I also thought the presentation was very pretty. These fritters tasted much better than I expected, not that I thought they would be bad but they certainly exceeded my expectations. I couldn't taste much of the crab itself but the sweet corn flavour really came through. Fried to golden brown, the crispy fritters were delicious with the cool and creamy rémoulade underneath. I loved the potatoes here. The rosti potatoes had a crisp surface and a tender, decadent center (the edges were naturally even more crispy and tasty), and the ratatouille and red chili pesto were both rich in flavour. The fish was not as well received, though. The skin was not crispy at all and even a bit rubbery, and although the fish itself was cooked well, the pickerel itself lacked seasoning. It needed a lot more salt and pepper. I guess the other components on the plate makes up for the lack of flavour in the fish. The duck breast was nicely cooked through with a pink centre, and I really enjoyed the salsa on top (salsa screams "summer" to me and I love that). I also liked the wheat berry salad and cilantro yogurt, which worked well with the bbq glazed duck breast. I couldn't taste any rye, but I didn't expect to since it would've long evaporated. When my server, Coco, noticed that I was having a hard time choosing which two desserts out of the three to order, she gave us all three! Other than the fact that she gave us an extra dessert, I also want commend Coco for her attentive and friendly service last night! The reason why Coco gave us all three desserts was because my initial dessert picks were for the other two desserts, not this one. Having heard our order, Coco told us that this pie was actually her favourite one, which of course, made me wonder if I was making a wrong choice. But still, I couldn't decide which dessert to give up for this one! Anyway, long story short, I enjoyed all three desserts for different reasons, and I honestly couldn't tell you my favourite one. I liked this particular dessert because the pie was served warm with a generous scoop of cold red current ice cream on top. I am always a sucker for the hot & cold combination! The pastry crust was excellent, too. Bonus points for the beautiful flower petals. Unlike the two other rich desserts, I took delight in the lightness and tartness of this cheesecake, which was not as light as, say a Japanese-style cheesecake, but still lighter and less dense than your typical New York style cheesecake. Two thumbs-up for the incorporation of lavender into the short bread underneath, and the orange blossom and blood peach accent flavours. This dessert was not as sweet as it reads so don't be alarmed. S'mores, minus the campfire, served parfait style is certainly a fun summer treat! Smooth, airy layers topped with chocolate chips, this chocolate mousse was lovely, especially for chocolate lovers. And that wafer served on the side was so, so delish. It also adds texture and crunch to the dessert. Thanks again for having me, Azure. It's always a pleasure dining at your restaurant. If you're on Instagram, make sure you tag your Summerlicious photos on Instagram with #blogtolicious or email them to challenge@blogto.com for a chance to win restaurant gift certificates! More details can be found here.